Overall: Natural avalanches are unlikely. Human triggered avalanches are possible, primarily where new wind slabs may have developed. Five inches of very light snow fell on January 20th at 10,800' with strong south wind. The wind trend this week started from the southwest and west, then shifted to the northwest and north, consistently 30-40 mph. Much of our above treeline snowpack was moved to new locations or sublimated back to the atmosphere. Snow which loaded onto leeward slopes may have formed potentially dangerous wind slabs. Watch for pockets and pillows of wind loaded snow below ridgelines and sheltered sides of gullies. Wind slab avalanches could be triggered by the weight of a backcountry traveler. Most recent wind loading is near ridgelines on southern aspects from this weeks persistent north wind. Whoompfing and collapsing was observed today, Friday morning. No human triggered avalanches were reported with the mid January storm cycle. Observers found evidence of localized natural avalanche debris on lower North Core Ridge on January 23, though the event was likely from earlier in the week, possibly from the January 20th south wind event. Below treeline may provide the best touring possibilities where slopes are protected from recent wind events. Snowpack stability tests indicate poor structure, moderate strength and moderate energy. Recent temperature gradients may indicate a transition from building weak facets. Persistent weak layers may be buried deep enough to lessen the likelihood of slope failure, though slope specific evaluation is recommended. Near and Above Treeline:Watch for pockets and pillows of new wind loaded snow below ridgelines and sheltered slides of gullies. Wind slab avalanches could be triggered by the weight of a backcountry traveler. Most recent winds have been from the north and northwest, potentially loading south and southeast aspects. Expect to also find wind scouring and wind packed snow. Below Treeline:Persistent slab instabilities may still exist in our snowpack. A reactive, faceted weak layer exists about 30 to 45cm from the ground, primarily on northwest, north and northeast slopes. Carefully assess run out zones and terrain traps. Snowy weather last week has helped the lower elevation snow coverage. Currently 35"-50" (100-120 cm) of snow cover can be found between 9,000- 10,000' and more above. There are reports of good snow near 11,000' in terrain sheltered from wind affects. Due to low elevation rain and warmth, the snowpack rapidly diminishes below 8,000', especially on sunny slopes. Wind speeds of sufficient force to transport and sublimate snow have been recorded at treeline elevations. Watch for wind loaded slabs, particularly on N, NE, E, SE, S and SW facing slopes near and above treeline. Also, wind slabs created from cross winds may exist in gullies on other aspects. Failures have been reported on south and southeast slopes above treeline due to this weeks 30-40 mph north and northeast wind event. Wind Slabs can be very hard, and may present a hollow drum like sound as you traverse the slope. If you are on an above treeline slope that is not wind scoured, then watch for thick hard wind slabs, and avoid. The probability of a human triggering a persistent slab problem has decreased. However, a new wind slab plus a human trigger may be enough to collapse a persistent weak layer on some steep and isolated slopes. Humphreys Cirque. Alternating wind events have produced wind slabs along ridgelines and various wind scouring affects. January 23rd photo by Paul Dawson. 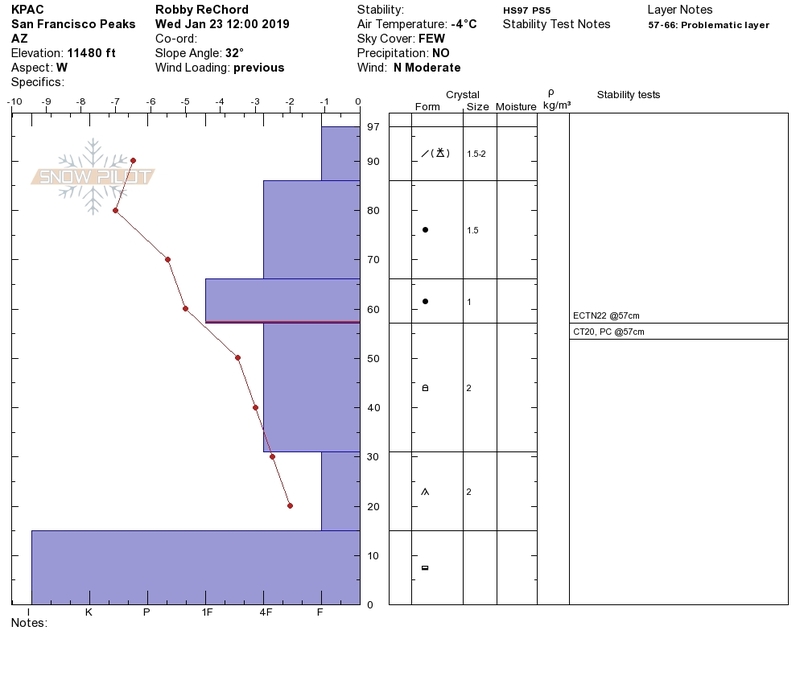 Snow profile from January 23, west aspect above treeline. Note the weak layer underneath wind slab at 57cm. Courtesy Robbie Rechord. Strong winds have been the story this week. This has led to significant snowpack scouring of the upper elevation slopes. Windy conditions will continue with a little less vigor as high pressure builds locally, and the likelihood of additional precipitation towards the end of the month grows increasingly slim. A warming trend will begin on Sunday January 27th, but windy conditions will pick up again during the workweek. On Friday morning, January 25th, the Inner Basin SNOTEL site (Snowslide) reported a snow depth of 32 inches (81 cm) at 9,730 feet. Arizona Snowbowl reported a settled base of 51 inches (130 cm) at 10,800 feet. So far this winter, 128 inches (325 cm) of snow have fallen at the mid-mountain study site. Since January 18th, SNOTEL temperatures have ranged between 11°F on January 23rd, and 49°F on January 20th. For the same period, the AZ Snowbowl Top Patol Station (ASBTP 11,555 feet) temperatures ranged between 5°F on January 22nd, and 40°F on January 20th.